I had a really great trip to Florida. Although we only popped into two stores, I managed to pick up 9 things that I am in love with. The two stores we went to were Lilly (duh) and Best of Everything. Best of Everything is a jewelry/accessories store with locations in both Naples and Bonita (if you are ever near, you must go!). mWs has raved about it and seriously, I am going to too. It is amazing. It's an absolutely huge store with wonderful jewelry and accessories (including some Lilly and Eliza B!) at really incredible prices!! First, from Best of Everything, I picked up 6 things! I headed to Florida really wanting a new cover-up and a knock-off David Yurman (my mom says she won't buy me a real one until I stop losing things...). Thanks to Best of Everything, I came home with what I wanted! 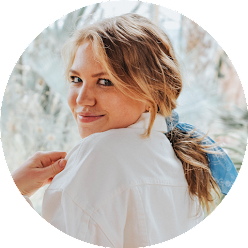 This cover-up was only $44 and I am absolutely obsessed with it! I don't know if you can really tell, but it is hot pink stripes with orange rope looking ropes, I guess, haha! I snagged this cute clutch for $25 and these adorable Lilly headphones (I head been using my iPhone ones and they hurt!!) for $28! Here is my little knock-off (someone at school yesterday asked me if it was Yurman!) 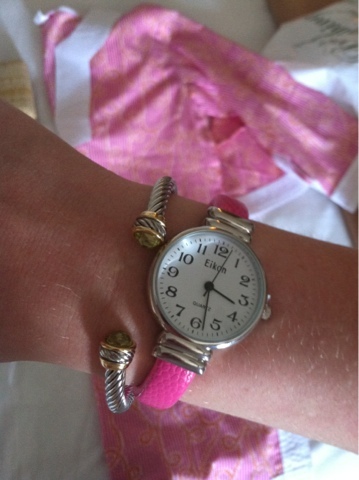 that was a steal for only $10 and this super wonderful pink watch that I got for only $8!! 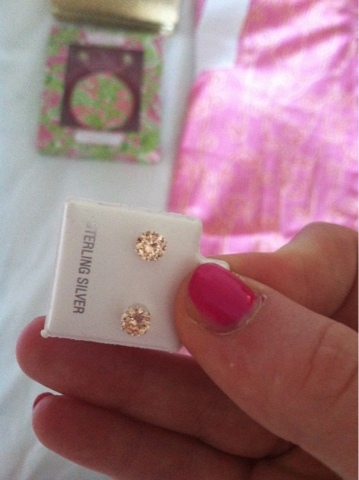 I'm not really into earrings, but my mom suggested I try out these cute little rose gold studs. I like them and for $5, how could I say no?! 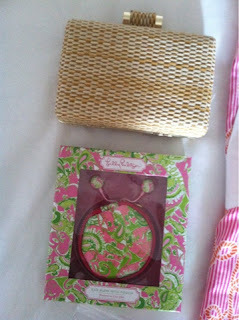 Next, from the Lilly store I picked up 2 (well technically 3) things!! First, when I saw these Lilly shorts I knew I had to have them. The pattern, Chomp Chomp, is so adorable with it's little P&G gators! 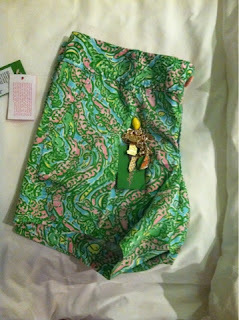 Also, since my mom and I splurged a bit, we managed to get the gift with purchase, the Lilly heritage charm bracelet! It's actually like the cutest thing... ever. This last item I am about to share was on the very top of my must-purchase list. I knew I had to have this dress when I went to Florida, and I actually can't believe I own it now. Yes, I got the Nina dress!!!!!!!!!!!!!! This is my first Lilly dress EVER!!!!! I think I like the printed a bit better, but the white looked better on me, so I am just as happy!!! It's so amazingly cute I can't even stand it! AHHH!!!!! Did you purchase anything fun on spring break? Adorable purchases - just in time for Spring! I have that charm bracelet too and I get complements on it all the time! My favorite charm is the shift that says "oh Shift!" on the back! 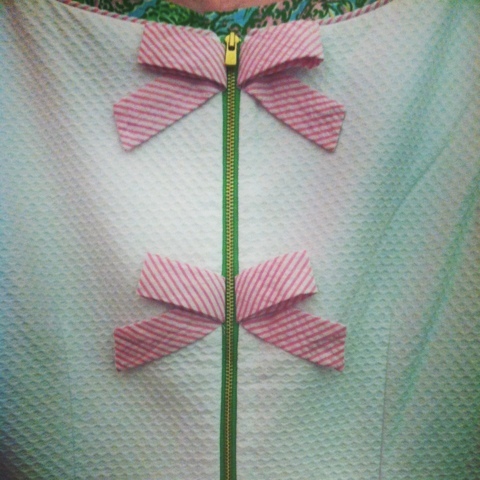 Leave it to Lilly to add the cute details. You're so lucky that you got the Nina dress! I've been dying to get it!